The BBC recently launched a new TV show called Dara O Briain’s Science Club. Dara O Briain is a popular Irish comedian and has been pursuing his interest in science by hosting a show discussing science (on BBC2). UK viewers can watch the full episode on iPlayer for free. In episode 1 Dara O Briain investigates the world of reproduction and inheritance. Science Club discusses some of the benefits of the Human Genome Project (HGP). An early question arises as to why the medical benefits promised by the HGP have not yet become apparent. Prof. Steven Rose explains that our genetics are much more complex that original molecular geneticists thought. The show then goes on to discuss epigenetics. Dr Tali Sharot introduces us to the agouti gene in agouti mice – this gene causes them to become fat with a yellow coat (rather than the normal small brown mouse). However we are shown a genetically identical mouse which has standard size and colouring (see image below). 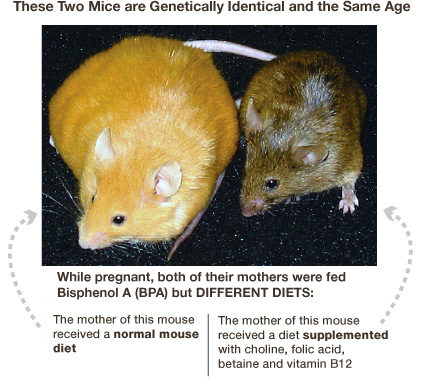 The only difference was the diet of the pregnant mother mouse. This means that one gene can express itself in two different ways depending on its environment. The reason was the diet changed the epigenetics of the offspring. The researchers then found that they could treat the mother mouse with a different diet and “cure” the offspring from the unhealthy agouti gene phenotype. Scientists believe that many diseases including cancers, type II diabetes and cardiovascular diseases are caused by the epigenome. If we can understand how to manipulate the markers for these epigenomes then we may be able to treat these conditions. Overall the “animal research” bit of Science Club was all of 5 minutes of a 60 minute show – but it is important to see that scientists and the media are engaging with this important issue in an informative and scientific way (rather than only bringing it up in the context of animal rights extremism). So if you are feeling crushed under the weight of scientific knowledge that we have provided – here is some science-oriented stand up from Dara O Briain. Posted on November 14, 2012 November 14, 2012 by EditorPosted in News, Science NewsTagged Agouti Gene, Agouti Mice, animal research, Dara O Briain, Science Club. Next Next post: Forty Reasons to Act. Five Minutes to do it. Great article and even better show…that guy is more effective than any of us scientists can be!